Liver Disease Can Happen Slowly Without Your Pet Complaining At All. Home » Liver Disease Can Happen Slowly Without Your Pet Complaining At All. Exams Twice a Year Enables Our Seattle Veterinarians to See These Subtle Changes in Your Pet. Hawthorne Hills’ Seattle veterinarians enjoy building relationships with our clients and with the pets they own. Twice yearly visits help our doctors recognize subtle changes in a pet’s health and can make a big difference in knowing when something is amiss even when a pet behaves normally at home. 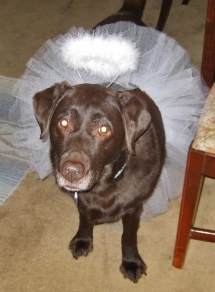 This month we are celebrating Lacey, a 12½ year old female chocolate Labrador. Lacey’s story exemplifies the importance of noticing changes, getting a proper diagnosis, formulating an effective treatment plan, and persisting even when the prognosis doesn’t seem favorable. As you can see from the picture above, Lacey is still queen of the house, and ready to enjoy the years ahead. Lacey, a patient with Hawthorne Hills Veterinary Hospital since she was a puppy, has been a healthy happy Chocolate Labrador. 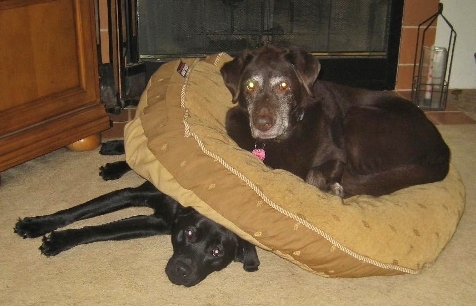 Lacey was excited to have a canine companion when the family welcomed a puppy sister, Kai, in June 2011. Regular examinations have been part of the veterinary care Lacey’s owners have provided, so during a visit in April 2012 they were not expecting anything other than a routine visit. During the exam Dr. Robin Riedinger discovered that Lacey had a mild weight loss, a little less strength in her back legs, a change in the muscles over her back, and a bit more ‘roundness’ to her tummy. While being more active with the puppy at home could contribute to weight loss, the full tummy and the muscle loss near the spine was different. Rather than ‘just watching these changes’ we decided to pursue further evaluation to better understand what was happening. Baseline blood tests and urine revealed an elevation in several liver enzymes. Mild changes in laboratory values can be a common change as dogs age and does not always indicate a significant problem. However, additional testing was appropriate to help us know how best to guide Lacey’s owners. Abdominal and chest x-rays were taken to evaluate the size and shape of the liver, as well as to assess the rest of the internal organs. The radiologist’s report indicated there was a very small amount of fluid in the abdomen. This suddenly raised our concerns for the possibility of cancer – something all pet owners worry about, and veterinarians hope is not the case. This is where the veterinarians at Hawthorne Hills Veterinary Hospital excel. We can help you understand the issues you and your pet are facing and we can help you to navigate the questions and concerns you will have, the diagnostic options, the treatment goals and the prognosis. 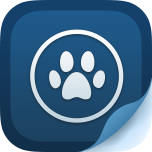 Our goal is to help you arrive at a best course of action for you, your family, and your pet. Within one week of Lacey’s examination she was scheduled for an abdominal ultrasound, by which time she had developed a ‘pot belly’ from fluid (ascites) accumulating in the abdomen. The ultrasound confirmed that Lacey had CIRRHOSIS of the liver, and fortunately no evidence of cancer. A treatment plan was formulated including a special diet (Hill’s l/d) to help the liver function well, diuretics (furosemide and spironolactone) to help the body resorb the excess fluid in the belly, antioxidants (Denamarin) to help with cellular damage, Vitamin E, and a medication (Ursodiol) to help mobilize the bile acids. We treated Lacey with an antibiotic (Metronidazole) for the first month to address any potential infection. Lacey was also lucky to have wonderful owners who were dedicated to doing their part at home, and within a short time Lacey was feeling remarkably better. Her energy returned, the fluid causing her swollen belly resolved, and her liver enzymes eventually came back into the normal ranges. None of us, Lacey’s owners or the doctors, could know or predict how well Lacey’s liver would respond, nor how long the improvement would persist. Fortunately, a medical problem that seemed to be a devastating diagnosis, and a situation that suggested Lacey might not live very long, has become a very manageable disease. It has been 18 months since we discovered Lacey’s liver problem, and she is doing great. She returns regularly for follow-up care and testing with Dr. Riedinger and is spending her days enjoying life to the fullest.